You are currently browsing the VC International archives for February, 2009. The VCI MK9 Carephone ™ Medical Alarm has been supplied to specialised medical alarm monitoring companies for many years, and sets the standard for field reliability and performance of telephone based medical alarms. Technology moves on and it’s time for a change, so throughout this year VCI will release a totally new range of Australian designed and manufactured medical alarm systems. Called the Gemini ™ range, the first product we are releasing is a stylish Pendant transmitter. Encouraging clients to actually wear their medical alarm pendant has always been a challenge. Many clients don’t have their pendant with them when they need it most, so anything we can do to encourage them to wear their medical alarm pendant is very worthwhile. While also significantly reducing overall size and weight, the attractive, ergonomically designed, slimmer, and significantly more powerful Gemini pendant greatly extends the range to the VCI alarm unit. It’s also waterproof to IP67 (International Environmental Protection Standard) and has a very long life lithium battery which does not need replacing. The Gemini™ pendant has been in development for a year using Sydney industrial design company Design-Edge. 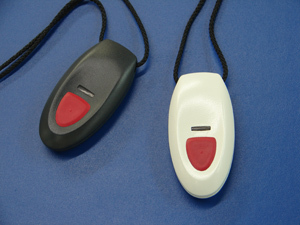 We believe it represents the leading-edge in medical alarm pendant design and will greatly benefit the end-users of our equipment. As well as being supplied with new equipment, the new Gemini ™ pendant can also be used with the MK8 and MK9 Carephone ™ Medical Alarms.